Just in time for Mother's Day! Personalize the tea tags in a box of your mother's favorite tea. The craft was developed by Rebecca Kedborn for Rebecca's DIY (and I found it via The Crafty Crow). Instead of drawing the art for each tag, you could recycle wrapping paper - do you save yours? - or calendars. Or dye papers with tea. For staining ideas and instructions, check out this tea staining board on Pinterest. 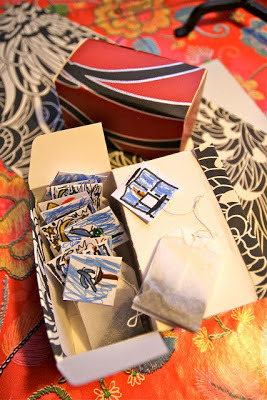 To hyper-personalize this gift, try making your own tea bags of loose leaf tea instead of using store bought bagged tea.